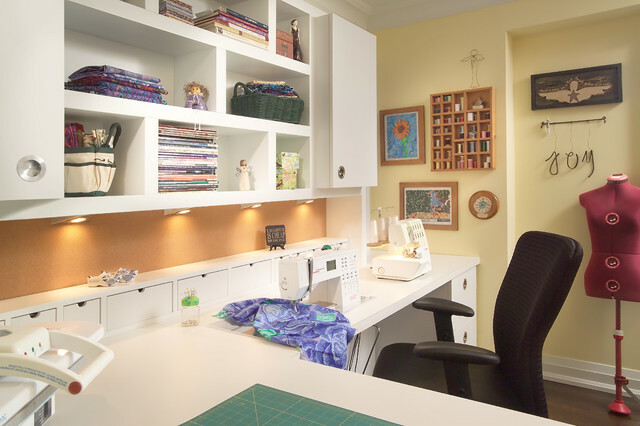 An existing spare room was used to create a sewing room. By creating a contemporary and very functional design we also created organization and enough space to spread out and work on projects. An existing closet was outfitted with cedar lining to organize and store all fabric. We centrally located the client’s sewing machine with a cut-out in the countertop for hydraulic lift hardware. Extra deep work surface and lots of space on either side was provided with knee space below the whole area. The peninsula with soft edges is easy to work around while sitting down or standing. Storage for large items was provided in deep base drawers and for small items in easily accessible small drawers along the backsplash. Wall units project proud of shallower shelving to create visual interest and variations in depth for functional storage. Peg board on the walls is for hanging storage of threads (easily visible) and cork board on the backsplash. Backsplash lighting was included for the work area. We chose a Chemsurf laminate countertop for durability and the white colour was chosen so as to not interfere/ distract from true fabric and thread colours. Simple cabinetry with slab doors include recessed round metal hardware, so fabric does not snag. Finally, we chose a feminine colour scheme. Cutting and sewing stations adjacent — should be different heights (tall to cut), and have pressing station nearby.